At Songadeewin, campers spend their days immersed in the natural wonder of New England’s most spectacular state. Here, wild mountain footpaths lead from our cabin doors to untouched forests filled with wildlife and nature’s mysteries. Hidden lakes welcome canoes to crystalline waters that reflect skies so clear and blue they seem like something from a dream. By day, hawks and falcons soar over nearby cliffs. At night, the cry of loons and the call of owls echo through the dark as the awe-inspiring Milky Way spins overhead and the sweet scent of pine summons peaceful sleep. This is the place our campers call home. And they will keep it in their hearts long after summer’s last sun sets. From our private beach to the mountains at our doorstep, our Council Fire Ring to our Art Studios, our (brand new) Dining Hall to our cozy cabins and classic tents, there’s more going in a single day at Songadeewin than most other camps offer all summer long. Each Songadeewin day is designed with the purpose of allowing girls to take safe risks, learn new skills and expand their horizons while freeing girls from the stresses of school and daily life, and allowing their imaginations roam! It begins with a full breakfast to keep everyone’s engines running all morning long. After this nutritious start, the entire camp convenes at the Council Fire Ring for a song or two and the day’s announcements. Girls pick a morning activity and then return to their cabins and tents for a quick daily cleanup before heading to the flagpole to raise the camp flag. Then it’s off to the day’s first activity! Though not every option is offered every day, there’s always plenty to choose from and our rotating selection of choices ensures that no two days are ever alike! Beach activities might include swim lessons, raft and tower diving, or even underwater exploration! 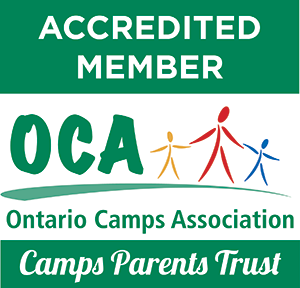 Campers who pass our safety tests can take out a canoe, kayak, rowboat, sailboat, or paddleboard. Back on shore, campers choose from things like dance, drama or singing. They might enjoy a game of soccer or some yoga. Or they can explore our new Arts Village, which offers ceramic and fiber arts programs. After morning activities comes some free time for a swim or a shower or just playing with friends. Then it’s lunch at 12:30, a rest hour, and our Afternoon Circles, where a second activity is selected. When that activity time ends, there’s a snack and then more free time for girls to practice their paddling and sailing skills, work on arts projects, participate in Running Club or do anything else they’d like. After supper, evening activities might include an all-camp campfire, small-group “cabin Night” activities, Longhouse (cabin groups) games, or flashlight tag. On weekends, the “Saturday Spectacular”, written and designed by campers with staff support, is always an entertaining evening of music, skits and surprises the girls have spent the week preparing. At every turn, we make sure two critical things are happening: The first is that girls live in continual close contact with nature. Rain or shine, we’re focused on erasing all barriers between our campers and the natural world. We also encourage the girls to take charge and run the show, to find and use their “tall, strong, Songa-woman voice” through built-in leadership opportunities that present themselves at every turn from daily activities to special events. Songadeewin is the only summer program for girls in the eastern U.S. to combine traditional camp-based life with extended wilderness travel. These extraordinary adventures lie at the center of the Songadeewin experience and form the crucial foundation of our work to build strong hearts, able bodies, and eager minds. At Songadeewin, whether by foot or canoe, everybody “trips” during their stay. Our tripping program is progressive with younger campers heading out into Vermont’s legendary backcountry for four days at a time, while the oldest girls canoe trip in the Canadian wilderness for up to 17 days. As girls grow up, the challenges our trips present increase. From paddling and hiking to setting camp and preparing dinner, they involve real work and that’s the point—trips are an outdoor “laboratory” where cooperation is a must, and each camper’s own capabilities are tested and grown in a slow process designed to build personal confidence, critical teamwork skills, acceptance of new ideas and perspectives, and that ineffable essential quality called grit. Girls return from trips with far more than indelible memories. They bring home a concrete sense of genuine achievement and a newfound personal strength that can only come from authentic experiences in the wild. There’s Always Something Good Cookin’ at Songadeewin! At Songadeewin, we live to eat and eat to live! Meals don’t just provide the fuel that gets our bodies going and gives them the energy they need for an active, engaged day. They’re also a chance to make new friends and share time with one another. That makes what we eat is as important as how we eat it. Three times a day, the entire camp gathers in our new Fraser Dining Hall, which sits on the north end of the Great Lawn. Here, we eat family style with overflowing serving bowls and platters passed between hungry campers. Variety is always on the menu with plenty of options from which to choose. Every meal features at least one vegetarian option while breakfast offers a fresh fruit bar, and dinner comes with an incredible salad bar that serves up plenty of fresh, healthy choices. Twice a week we have big lakeside cookouts on the shore of Lake Dunmore! Tradition plays an important role at Songadeewin. It’s the glue that binds generations of campers together and the rock to which we anchor our hearts in a sometimes turbulent and uncertain world. At Songadeewin, our traditions stretch back over 90 years and have grown to encompass all kinds of ceremonies and celebrations that add an extra dimension to every week all summer long. In July, our campers celebrate Valentine’s Day and plan our annual Carnival, an eagerly anticipated day of special games and activities that the girls create, organize and host themselves. In August, it’s time for Halloween, a spooky night on haunted summer shores. Midsummer finds us embarking on our annual Songathon, the world’s most unique relay race, which includes everything we do at camp from archery to tent-pitching. We drag our sleeping bags out onto the Great Lawn for a monthly Movie Under the Stars, and we recognize fourth-year campers on Old Timers Day, which finds these veterans writing a new camp song for everyone to share, completing a service project as part of their summer experience, and being honored at a special campfire. And, of course, no stay at Songadeewin would be complete without a Candlelight Ceremony, a very special evening where campers reflect on the camp ideals they’ve learned and perfected and the many close friendships they’ve made.